« Wonderful list about what Dianne Sylvan does and does not care about. 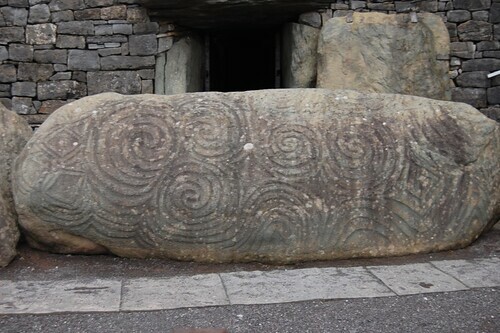 The entrance stone at Newgrange. Photo by me - 2011. What is my place in this world? Where does my tribe belong? We were born of the ancestors, the wise ones of blood, heart, and place. The ancestors share their wisdom and lore. The ancestors inspire us. The ancestors teach us what is and isn’t worthy. The ancestors were born of the Gods. The Gods, beyond human death, flow with ever-growing wisdom. They are the keepers of secret knowledge. They share their blessings with the honorable. They smile upon the hospitable, generous, pious, moderate, and loyal. They love the courageous, curious, and talented. They teach us like a master smith shapes metal. The Nature Spirits were born of the Gods. We are the brothers and sisters of the Nature Kin and must give them their due respect. We walk, run, dig, swim, fly, hop, crawl, slither, and grow upon the Earth Mother,together, united in the sacred dance of life and death. We are the hunters and hunted alike. We are of the middle world with our brothers and sisters. When I go to the grove – when I go to my altar – I remember the order of things. I light the sacred fire to remember all sacred fires. I silver the well to remember all sacred wells. Life…death…life…death… That is the way of things. When I go to the grove – when I go to my altar – I remember the order of things. I make offerings to the tree, the bíle, an ancient fellow in the middle realm who reaches to the Upper and Lower Worlds. The tree connects us to the realms. It shares with us food, shelter, and, if you listen, wisdom. Honor the trees and tread lightly in their realms! Look to the tree and know your place in the world. Sky above, Earth below, Sea around. I am a Druid, a child of fire, water, and tree. I am a Druid, a lover of the Nature, Ancestors, and Gods.